Background: Lap Group Roma was established in 1999 to promote and control the development of laparoscopic surgery in the area of Rome and its province. Complications during the creation of pneumoperitoneum were given a high priority of investigation, and a retrospective enquiry was immediately carried out. Methods: A questionnaire about all laparoscopic surgical practice performed from January 1994 to December 1998 was sent to the supervisors of 28 centers of general surgery in the area of Rome and its province participating to the Lap Group Roma, requesting demographics, type of procedure for the creation of pneumoperitoneum, type and timing of operation, and major vascular, visceral, and minor vascular injuries related to the creation of pneumoperitoneum. Results: The questionnaire was returned by 57% of the centers, for a total of 12,919 laparoscopic procedures. The type of procedure used to create the pneumoperitoneum involved a standard closed approach (Veress needle + first trocar) in 82% of the cases, an open (Hasson) approach in 9% of the cases, and the use of an optical trocar in 9% of the cases. There were seven major vascular injuries (0.05%), eight visceral lesions (0.06%), and nine minor vascular lesions (0.07%), for an overall morbility of 0.18%. There was no death related to these complications. The rate of complications differed significantly (p < 0.0001) depending on the type of approach used. It was 0.27% with the optical trocar (3 of 1,009 cases), 0.18% with the closed approach (20 of 10,664 cases), and 0.09% with the open approach (1 of 1,135 cases). 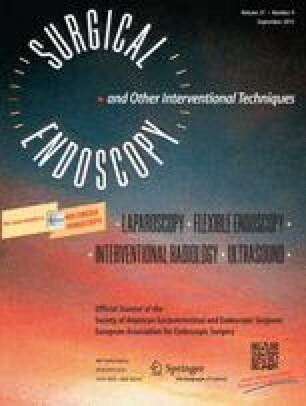 Conclusions: There is no foolproof technique for the creation of pneumoperitoneum, and this inquiry confirms the need of a constant search for prevention and early treatment of complications encountered during this obligatory phase of any laparoscopic approach. A well-conducted and prolonged prospective audit of clinical practice could help in identifying the risk factors that can make an alternative approach (open or video controlled) preferable to the widely used closed approach.